I hate to break it to you: Editing your work before publishing is crucial whether you’re new to content creation or a well-seasoned writer. Typos, grammar mistakes, and clunky sentence structure can creep up on all of us in articles, Instagram posts, Facebook ads, or marketing materials, and the best way to avoid that silly, I did not just do that feeling is to keep a close eye out for common pitfalls. The good news is, we all do it! Despite the attempts of our early educators to drill those grammar rules into our heads, when we start hustling to write that photo caption it’s easy to forget an important comma or drop the wrong their, they’re, there. Creating a system for editing your content before it goes public is hugely helpful in this arena. Leave a note on your desk with a list of things to double or triple check, add some buffer time in your schedule to re-read drafted content, or have someone else on your team put an extra set of eyes on a piece that’s giving you grief. One of your best editing resources will always be your own history. Knowing where you struggle can show you where you need to spend a little extra time combing through to catch errors. Where I struggle, you may be a wordsmithing rock-star, and vice-versa. 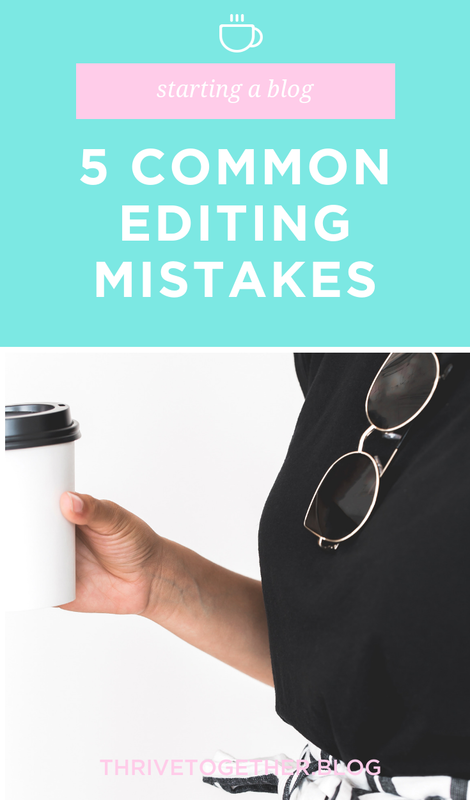 So, in the spirit of celebrating our totally normal and shared capacity for human error, here are five of the most common editing mistakes I struggle with. Let this list get your brain going and think about the sticky points in your own writing process. Make a list, shout it out in the comments and above all, remember: ain’t no shame in our grammar blundering game. The best was to catch these errors is to re-read your content and don’t be afraid to Google your way to the right answer. I am also a huge fan of Grammarly, a writing app designed to assist in polishing your writing and catching those overlooked mistakes. Ultimately, there’s no right or wrong answer. Figure out what your preferred style is and stay consistent. I suggest checking out this super-handy and thorough common usage article for more. Sentence Fragments: Make sure every sentence has a subject and verb and contains a complete thought. Run-On Sentences or Sentence Sprawl: Lengthy sentences can become tiresome for the reader and lead to confusion. Reading through your work and verifying your message reads clearly can help you avoid this. Apostrophes are used to indicate possession (Jessica’s purse or Jess’ purse) and in contractions (They’re making dinner). A common mistake is to use apostrophes to indicate plurals (The stores display’s of product). When two words come together, they can be written in a variety of ways: open (coffee cup), closed (notebook), and hyphenated (short-term). Often times it’s confusing to know which option is right. It’s helpful to look over the rules, but once again, don’t be afraid to use online resources whenever you get stuck. The English language is constantly evolving, creating new word structure every year. Just think about the time “online” was “on-line” and “facepalm” wasn’t in the dictionary! Jessica is a born-and-raised Wyoming gal, dreamer, traveler, communications consultant, and freelance writer. A former wedding-cake baker turned community champion, her entrepreneurial spirit has carried her through many phases of life. She believes in the healing powers of tacos, travel, and hula hooping in the sunshine and makes a mean chocolate cake.